The US bank prime rate remained unchanged during the second half of October, at 3.25 percent. The prime rate is an indication of the general environment for interest rates, but it is far from the only factor determining credit card rates. In fact, one can get an feel for the influence of the prime rate on credit card rates these days from the fact that the prime rate makes up less than 25 percent of the average credit card rate in each category. In other words, the prime rate is still a factor, but creditworthiness and profit considerations are more of a factor. This is why credit card rates continue to move up and down, despite the fact that the prime rate has been stable for over two and a half years now. Late October saw the latest example of those changes in credit card rates, as the average for consumer rewards credit cards dropped by 0.08 percent, to 17.55 percent. This was the best example of how the credit card market favored customers in the second half of the month, but the stability in the other credit card category averages was also a plus for those customers, since interest rates generally rose throughout the month. Across most of the yield curve, from 2-year Treasuries to 30-year Treasuries, interest rates rose through most of October. This could be a reflection of some fresh optimism about the economy - after all, the stock market also rallied during the month - or it could also be an recognition of rising inflation pressures. Either way, rising interest rates should make things more expensive for borrowers, but this was not the case for credit card customers in October. The drop in the average rate for consumer rewards credit cards pulled the overall average for consumer credit card rates down by 0.05 percent, to 16.75 percent. 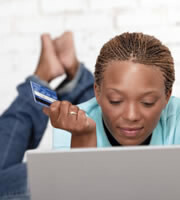 The average for consumer non-rewards credit card offers remained unchanged, at 14.88 percent. On paper, having rates for consumer rewards cards drop while rates for non-rewards cards stayed the same should slightly alter the trade-off between higher rates for rewards cards, and the value of the rewards offered by those cards. However, it should be noted that this trade-off is really only relevant for consumers who regularly carry a balance on their credit cards. Consumers who pay their cards off in full every month don't pay any interest, and thus are not affected by the differential between rewards and non-rewards interest rates. Student credit card offers remained unchanged in late October, marking the second full month for which the average rate in this category has been stable, at 16.59 percent. After dropping in the first half of October, business credit card rates remained unchanged in the second half of the month. This left the average for business non-rewards cards at 14.11 percent, and the average for business rewards credit cards at 15.76 percent. As noted in the overview for this update, even holding steady is a victory for customers during a time when interest rates generally were on the rise. The spread between the average rate for consumers with high credit ratings and the average for consumers with mediocre credit compressed slightly, to 4.07 percent. While the implied penalty is lower, it should be noted that 4.07 percent is still a pretty steep price to pay for a lower credit rating. 0 Responses to "Rewards credit card rates move lower"